The first two facades have been taken off. Martín Jasper shares with us, his impressions about New York in an urban scale. Creatividad Ética Magazine, Buenos Aires, Argentina, pp. 19-21. The client asked a house design in a field located in Buenos Aires Province, on the Pampa Humeda zone. The project had a deep analyze about building recycling and reuse, the project tries to adapt the existing house to the client necesites, with an understanding about how is the way of build and living in the area. Eficiencia Energética, Uruguay. pp. 23-26. Martín Jasper explains the Estancia LL Project, a house located in Lincoln, Buenos Aires - Argentina. In this project had been aplicated efficient solutions, for energy save with tradictional architectonic values typical from the construction zone. Creatividad Ética Magazine, Buenos Aires, Argentina, pp. 16-17. The media focus on architectonic sustainable as a sustainable solution for the environment. However, the sustainable architecture is a large topic, that can have a lot of conceptual levels, these levels can be integrate in a big projectual thought, generating the architecture value that is looking for with these concepts. 2010 - Revista 90+10 Nº28 Especial Diseño Sustentable, pp. 67-68. In the construction case, is fundamental to have a conscience about the environment in which the construction is located. The initial goal is the energy save and the protection of the natural resources, trying to reduce the environmental impact. The Ministry of industry, energy and mines and the Ministry of housing, territorial ordering and environment, with the Montevideo Municipality, announced the arrive of the German House. Is an efficient house prototype, was the winner award on the Global contest solar house decathlon in Washington. The contest was realize between 2007 and 2009, and is knowledged as a prestige event, organize by the United States Energy department. 2009 - W. Schmidt, Peter & Jasper, Martin, Arquitectura sustentable. 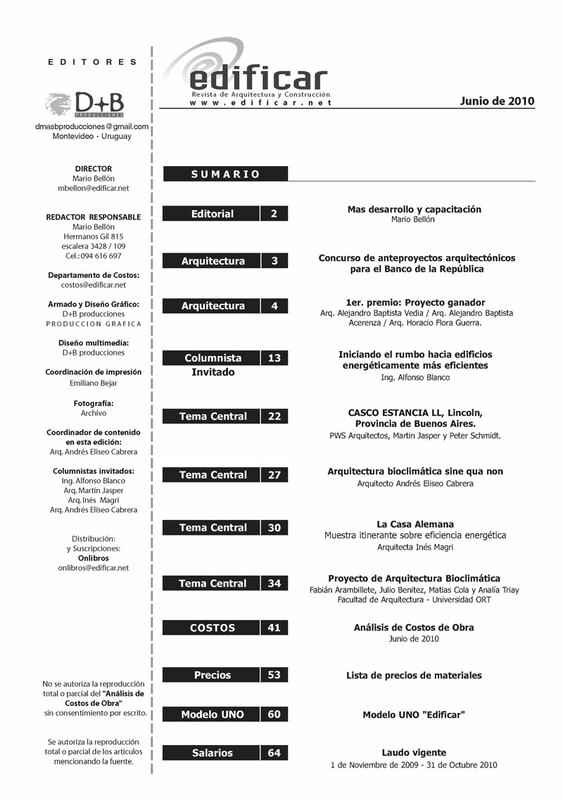 Hacia una estrategia integradora, Revista de Arquitectura Nº233, Ed: Sociedad Central de Arquitectos (S.C.A. ), Buenos Aires, Argentina, pp. 92-97. The mediatic peak that we can perceive in these last years, about sustainable topics since the global climate change, has generated some initiatives on differents areas, including the design and architecture. The Sociedad Central de Arquitectos in Argentina, organized the International Seminar: Environment, Energy saving and tecnological innovation in Architecture. The event had the participation of reconized especialists, on the susteinable architecture topics. Conference on the concepts of applications of new technologies for improving our lives in Mega Cities, by the using and managing of big data in real time to optimize the urban processes into a more efficient development. Introduction to the five chapters from the Paraguayan Norm of Sustainable Construction, and how apply them in an architecture local project. Workshop of the five chapters from the Paraguayan Norm of Sustainable Construction, and how apply them in an architecture local project, from the design to the construction. Construction STart of First Bungalow Rincon Retreat. 11/24/2016 - NORMA PARAGUAYA DE CONSTRUCCIÓN SOSTENIBLE: Una Herramienta Para Todos. Charla informativa sobre la construcción sostenible en Paraguay. Informative lecture, about the sustainable construction in Paraguay. Located in Quito city (Ecuador), the contest purpose was the creation of a project with 3 types of apartments (1, 2 and 3 bedrooms) and design a square that joins the project business premises with the environment. BUILDGREEN is an event with technical training, lectures and offers services and products, that have sustainable references. It´s open to students and professionals. This estate of 4 buildings was constructed on a piece of land located in Buenos Aires Province, in the region of the so-called "Pampa Húmeda". The only reference on the open land was a line of trees that worked as a directional axis, to locate and position the four constructions: a principle house, a attendant house, a guests house and a water tower. The new technologies application in work spaces and the planification of them with the Certificate for sustainable and green building (DGNB System), explain the most innovate concepts, when it´s time to think and and design a work space. The buildings mixed use are a more accepted option as a life/work option. the proposal of this project is a mixed use building in Quito - Ecuador. The building design rejects a typical facade, it uses the terrain´s deep as an instrument to define a project profile. The determined value of construction sustainable certificate, during the project development. International lecture about the architecture future and how the technology, the real state could be improved with these new technologies. Which are the principal characteristics of a sustainable construction? Environmental, Technical, Economical, Cultural and Social components define the parameters of sustainability only when considered with an holistic approach. The global impact in the entire building's life cycle is the relevant factor in analyzing the sustainable value of a project. Publication in "EL CLARIN" about Smart Office Vienna on the energy production in this Smart Building. Presentation of the sustainable construction system DGNB, and the construction system call Passivhaus. 2014 - Casa Eco solar, award winning project at BIA-AR in the Physical and social sustainability category. "The Eco-Solar House" wins an award at the Argentinean Architecture Biannual "BIA-AR", in the category "Physical and Social Sustainability". The project looks for solving the energy problems of the Argentinean Highlands, so called "Puna". The designed prototype is self-sustaining in terms of energy, using low-tech solutions for solar power usage and local materials for high energy efficiency. Buenos Aires, Argentina. pp. 6-8. Publication in "EL CLARIN" of our HABITACULO LA SUNSHINE, a minimal housing project constructed in the middle of the Argentinian "Pampa Humeda". It was designed with local materials, focusing on the low impact on the local environment. 03/17/2013 - WORKSHOP: SUSTAINABILITY AND RESOURCE EFFICIENCY IN BUILDINGS AS THE GREATEST CHALLENGE IN CURRENT CONSTRUCTION. The Institute for Housing of the Buenos Aires City Government (IVC), hosted a workshop about sustainable construction to explore the possibilities of including sustainable parameters in the development of social housing structures. This event was attended by leading professionals of the IVC in construction, engineering and architecture. The lecture was about the “Smart Cities / Smart Buildings” concept and the new technologies, and how this can contribute to the real state management. Event organized by the Secretary of Research and Development, and the institute of applied technologies faculty of the the UMET university. The lecture was about sustainability, energy efficiency, renewable resources, and new technologies applied on architecture. The Lecture explores the Trends of sustainable development in Germany, showing examples of how these trends are used in intelligent buildings and other sustainable projects. The lecture analyzes the functionality of the so called "Energy Pass", as a tool for the management 0f energy efficiency in Buildings, and the differences between the use of high tech for renewable energy production in big scale buildings and low tech solution for rural construction in south america. The Architects Association of Argentina (SCA), published the winning projects for the first prize of Sustainable Architecture and Urban Design. Our Project "CASA ECO SOLAR" won the first prize in it's category. First Green-Ar congress edition, sponsored by the German Argentinean Chamber of Industry and Commerce and the Germany embassy in Buenos Aires. Publication on the "Casa Eco Solar" project. The Eco Solar house is a prototype designed to be a training center for renewable energies, focused especially on the use of Solar energy. With a low - tech sustainable approach, the prototype was designed for the rural areas of northern Argentina, and was adapted to the local climate conditions. The lecture explains the different technical solutions of a self-efficient ecological prototype - the Ecosolar house - and the process of obtaining the Energy Efficiency Certificate. Martín Jasper explained the integrated concept “Ganzheitlichkeit”, how could it be aplicated on any design process, recognizing it as an inclusion exercise.